The proper healthcare starts by choosing a healthy lifestyle that can help you reduce the risk of coronary heart disease (or minimize its damage), increase your stamina, and can lead to a longer healthier life. Practicing the 10 Essentials for Health and Wellness gives us the healthy habits we need for healthy aging. And supplementing with the right nutrients helps us get what we need to facilitate the replacement of old cells with new healthy cells. Learn more about each of the factors that affect your lifestyle by using the links below. The Dietary Guidelines for Americans show how good dietary habits can promote health and reduce risk for major chronic diseases. The Food Guide Pyramid and the Food Label are tools to help consumers make informed food choices in the context of a healthy diet. Use the Food Guide Pyramid to help you choose healthy foods each day. less than 100% of the Daily Value (DV) for total fat, saturated fat, cholesterol, and sodium. at least 100% of the Daily Value (DV) for fiber, calcium, vitamin A, vitamin C, and iron. Excess body fat leads to health problems such as type 2 diabetes, high blood pressure, and high cholesterol. Health professionals use a measurement called body mass index (BMI) to classify an adult’s weight as healthy, overweight, or obese. 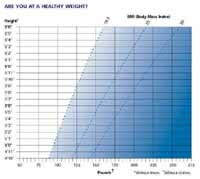 BMI describes body weight relative to height and is correlated with total body fat content in most adults. National Heart Lung and Blood Institute’s BMI calculator. Having excess abdominal body fat is also a health risk. Men with a waist of more than 40 inches around and women with a waist of 35 inches or more are at risk for health problems. To lose weight, you must eat less and move more. Your body needs to burn more calories than you take in. Exercise improves heart function, lowers blood pressure and blood cholesterol, helps manage diabetes, and helps control weight. The National Heart, Lung, and Blood Institute (NHLBI) at NIH recommends that adults get at least 30 minutes of moderate physical activity on most days of the week. Talk to your doctor about what forms of exercise are best for you. Smoking cigarettes significantly increases your risk of coronary heart disease. Tobacco smoke increases your risk or atherosclerosis. Smokers have more than twice the risk of having a heart attack as non-smokers. Smoking is the biggest risk factor for sudden cardiac death. Smokers who have a heart attack are more likely to die than non-smokers who have a heart attack. In the first year that you stop smoking, your risk of coronary heart disease drops sharply. In time, your risk will gradually return to that of someone who has never smoked. (FDA Consumer Magazine, November- December 1997). The link between stress and coronary heart disease is not entirely clear. However, people who have too much stress or who have unhealthy responses to stress may be at greater risk of having coronary heart disease. Stress speeds up the heart rate. People with heart disease are more likely to have a heart attack during times of stress. People sometimes respond to stress with unhealthy habits such as smoking or eating salty or high-fat foods. I’d like to thank the U.S. Food and Drug Administration (www.fda.gov) for sharing their information and letting me place it on my web site. Click here to check for updates of this information.